What is it about cookies that make the Christmas season special? It seems to be on everyone’s list of traditions…and a welcome one at that. Something about these sugary morsels of confectionary delight melts our hearts as well as our waist lines to get us in the mind set of the holiday season. So as we get in the spirit of Christmas…let’s be sure to take little moments to pause and reflect on what this holiday season means to us. 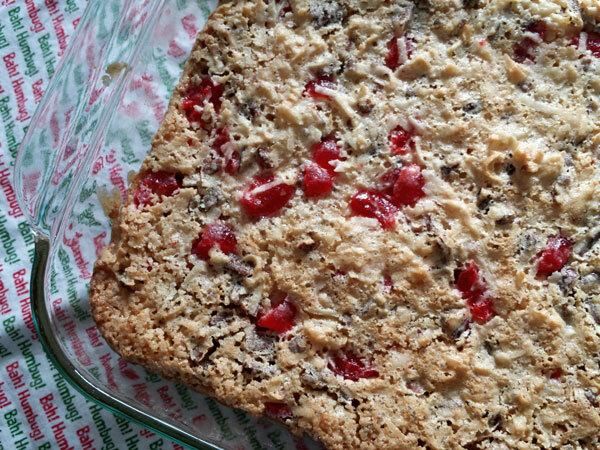 My favorite way to reflect is elbow deep in these delightful cherry coconut bars alongside a strong cup of joe! While the oven is preheating let’s create a gloriously simple crust. All we need is butter, flour and powdered sugar. Pinch the butter using your fingers to cut the butter into the flour mix. Eventually a dough will form- a smooth, pliable dough- that we will press into an 8 inch pan so that it covers the bottom of the dish evenly. This will bake for about 25 minutes so that the coconut filling will have a firm foundation. DO NOT OVER BAKE! The crust should still be pale in color. If we over bake the crust, then the filling will not stick well thus impeding the presentation of the dish…and we do not want that do we? 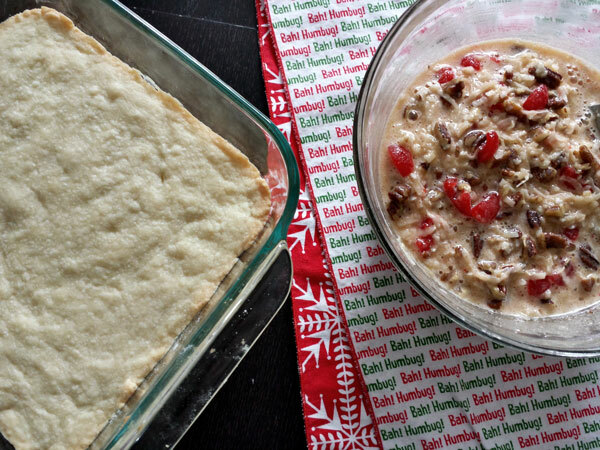 The filling for these bars is everything that’s right with the holidays. Truth be told, I make these more than just this time of year, but something about this cookie transports me back to the holidays. 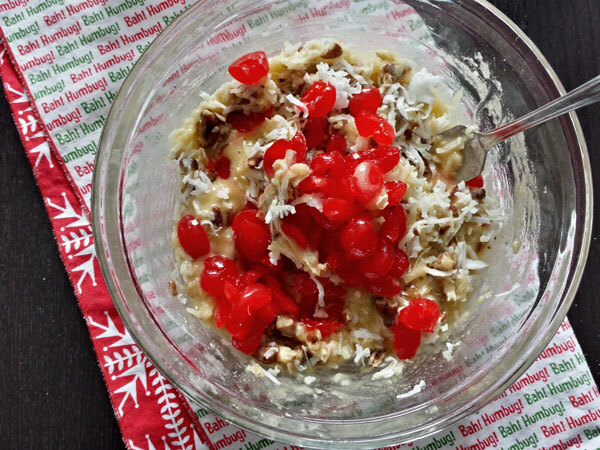 Pure joy, pure love in the form of gooey, coconut- cherry goodness! Let’s get cooking! Lightly beaten eggs are mixed with sugar, flour, baking powder, salt and vanilla to create the base of our filling. 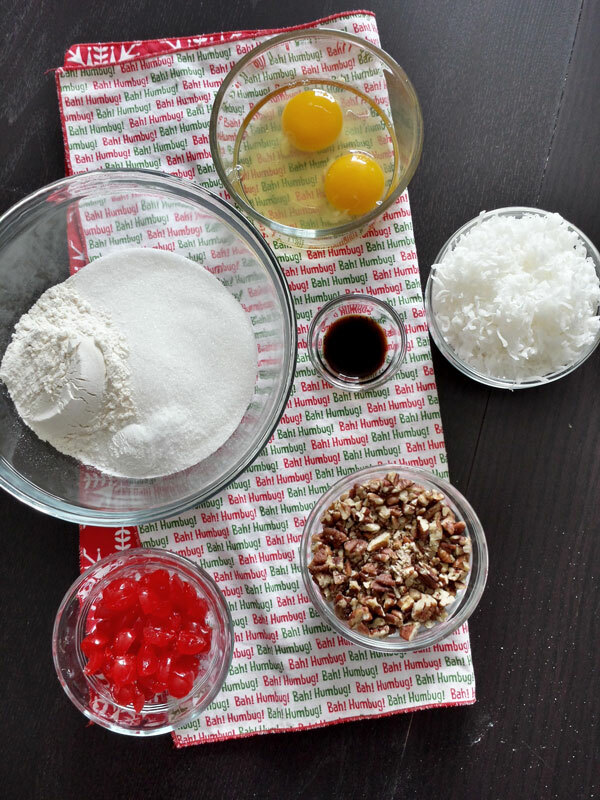 Gently fold in some chopped pecans, coconut and maraschino cherries (my favorite!). Pour the filling over the par-baked crust and spread so that it covers the bottom evenly. Allow to bake in the oven for another 25 minutes. The top of the filling will turn a nice golden brown. Now here’s the scary part, as you remove the pan from the oven the center of the bars will be very wiggly. It will appear that the center did not set at all, but have faith…it will. The trick is to let it cool completely. As it cools the center of the filling will become firm and will set to the perfect gooey consistency we desire. Be patient, it’s worth the wait! Slice into 18 bars…or larger bars if you can’t resist and be prepared to melt in to the holiday spirit. I am telling you, something about these cookie bars fill you with joy and anticipation for what this holiday season has in store for us. Glory to God…Glory to God…Glory to God… FOREVER! Preheat the oven to 350 degrees. Make the Pastry crust by mixing the flour, butter and confectioner’s sugar in a small bowl. 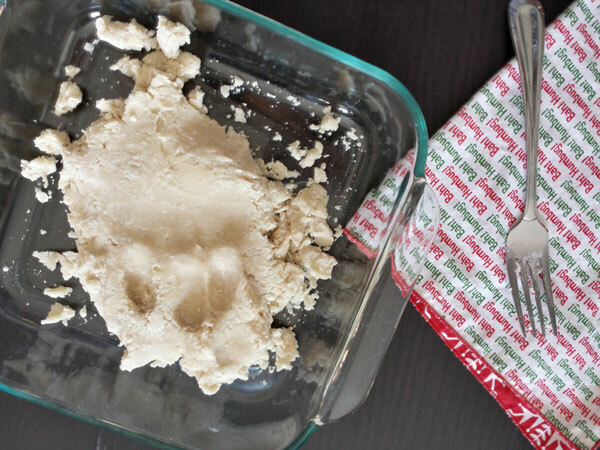 Use your fingers to pinch the butter into the flour mixture until it turns into a smooth dough. 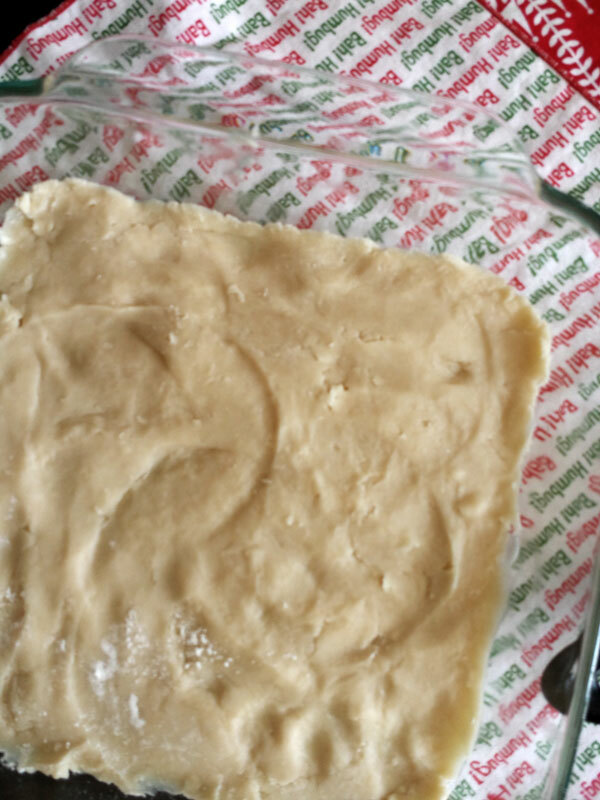 Press the dough in an 8 inch square pan so it covers the bottom evenly. Bake the crust in the oven for 25 minutes. It should not be browned when it comes out of the oven. Meanwhile, make the filling in a separate bowl by combining the remaining ingredients until it forms a homogenous mixture. Spread over the top of the baked pastry. Bake about 25 minutes till the top of the filling is golden brown. The filling will set as it cools. Once the bars have cooled completely, slice them into 18 equal sized bars. ** Do not over bake the pastry or the filling will not stick too well. Made some last week and made your dad very happy. Looking forward to another batch.